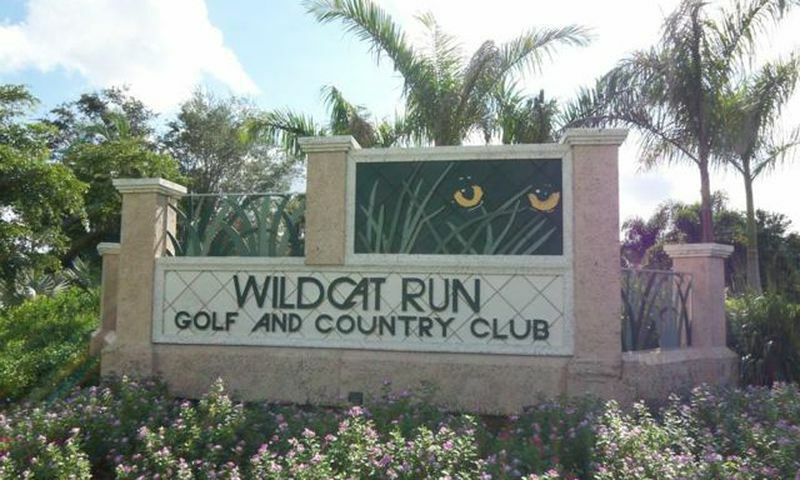 Wildcat Run Golf & Country Club is a gated golf community in Estero, Florida. Wildcat Run offers luxurious condos, townhomes, and single-family homes on a resale basis. Homeowners enjoy a luxurious clubhouse with tons of amenities in a tropical climate. The low-maintenance living also provides residents with ample time to enjoy all that Wildcat Run Golf & Country Club has to offer. Wildcat Run Golf & Country Club offers its residents the best in both indoor and outdoor amenities. The 26,000 square-foot clubhouse provides a great location for socializing with neighbors and friends. Whether it is billiards in the hobby and game room, bridge in the card room, or joining a book club on the back patio, there is always something going on at Wildcat Run. Staying in shape is never a worry with the state-of-the-art fitness center and weekly workout classes. Outdoor amenities include two satellite pools each located at The Villages and Cypress Cove neighborhoods, five lighted Har-Tru tennis courts along with an additional two tennis courts at The Villages neighborhood section, and an 18-hole Arnold Palmer-designed golf course. Golf Equity and Preview Golf memberships are available for residents and non-residents. Each of these is designed to give you exactly what you are looking for from Wildcat Run Golf & Country Club. Multiple builders have constructed homes within Wildcat Run Golf & Country Club. There are approximatley 450 residences consisting of luxurious condos, townhomes, and single-family homes. One of the builders, WCI Communities, started construction in 1989 and finished their phase of the community in 2003 with 40 villas and 44 condo units. Wildcat Run focuses on providing its residents with low-maintenance living at its finest. The first choice for homebuyers are the condos. These two-story condo buildings offer four to six units per building. They have two to three bedrooms, two to three bathrooms, and attached garage parking. They range from approximately 2,000 to 2,500 square feet of living space. Townhomes are a popular choice in Wildcat Run and offer great low-maintenance living. These townhomes are two-story homes and beautiful scenic views. These townhomes are two-story residences with two to three bedrooms, two to three bathrooms, and attached two-car garages. They range from approximately 1,700 to 2,100 square feet. In addition to condos and townhomes, there are also single-family homes. These homes range from smaller detached villas to large estate homes. These single-family homes range approximately from 2,160 to 2,600 square feet of living space. They have two to four bedrooms, two to four bathrooms, and attached garage parking. All homes offer beautiful scenic views and most have private pools under covered lanais. While there is the luxurious Wildcat Run clubhouse some of the neighborhoods within the community enjoy a community pool and tennis courts. Residents of Wildcat Run enjoy an active and vibrant lifestyle. With a planned calendar of clubs and activities there is something to do at almost all times of the day. Book clubs, card clubs, and arts and crafts clubs meet regularly in the clubhouse. Tennis and golf leagues are favorites among residents and offer different flights for all skill levels. Themed dinners and community events are other ways neighbors become lifelong friends at Wildcat Run. Wildcat Run is located in Estero, Florida, just east of Highway 75 off Corkscrew Road. This area offers excellent shopping, dining, and entertainment options. The community is only minutes away from three major shopping destinations including Coconut Point, Gulf Coast Town Center, and Miromar Outlets. Residents also enjoy close proximity to many of the beautiful beaches on the Gulf Coast. The beautiful tropical climate along with a myriad of things to do in the area makes Wildcat Run Golf & Country Club one of the most sought after communities for homebuyers in Southwest Florida. There are plenty of activities available in Wildcat Run Golf & Country Club. Here is a sample of some of the clubs, activities and classes offered here. These two-story condo buildings offer four to six units per building. They have two to three bedrooms, two to three bathrooms, and attached garage parking. They range from approximately 2,000 to 2,500 square feet of living space. Please Note: Floor plans are not available at this time. Townhomes are a popular choice in Wildcat Run and offer great low-maintenance living and beautiful scenic views. These townhomes are two-story residences with two to three bedrooms, two to three bathrooms, and attached two-car garages. They range from approximately 1,700 to 2,100 square feet. Please Note: Floor plans are not available at this time. The single-family homes range from smaller detached villas to large estate homes. All homes offer beautiful scenic views and most have private pools under covered lanais. They range from approximately 2,160 to 2,600 square feet of living space. They have two to four bedrooms, two to four bathrooms, and attached garage parking. Please Note: Floor plans are not available at this time. Back in 2010 we purchased a home here and it's proven to be a fantastic investment. The home is very unique with beautiful architecture and high-end quality. The community itself is outstanding and the golf course is one of the best in the country, in my opinion. 55places.com is not affiliated with the developer(s) or homeowners association of Wildcat Run Golf & Country Club. The information you submit is distributed to a 55places.com Partner Agent, who is a licensed real estate agent. The information regarding Wildcat Run Golf & Country Club has not been verified or approved by the developer or homeowners association. Please verify all information prior to purchasing. 55places.com is not responsible for any errors regarding the information displayed on this website.